I am about to tell you about an amazing product. 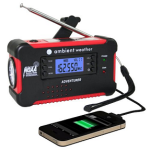 It’s a mouth full and called the Ambient Weather WR-111B Emergency Solar Hand Crank AM/FM/NOAA Digital Radio with Flashlight, Cell Phone Charger with NOAA Certified Weather Alert or for short the Ambient WR111B. If you’re interested in purchasing this product, you can find it here discounted with free shipping. Yes, it has quite a name and what’s more, it can do quite a lot for you and your family during an emergency. And it does it all in one compact box. The Ambient Weather Solar WR-111B Radio is solar powered, but that isn’t the only way that you can charge the system. It can also be charged using a USB device, an AC or wall power adaptor, a DC or car charger, as well as a hand crank. Basically, it is virtually impossible for this machine to run out of power and not be able to do its job for you. You can use it at any time, any place, and in any type of emergency conditions. The charging system is based on using rechargeable lithium ion batteries. It comes with an integrated LED flashlight, which can be used as an emergency lighting source. It also has a headphone jack making so that you can have a quiet or personal listening experience. And it offers a retractable antenna to help you to pick up a wide range of radio stations. It does all of this and it weighs less than a half of a pound. Because it has a self charging mechanism it is able to convert your kinetic energy from the hand crank into stored energy. Plus, in the right conditions it will continue to charge while it is in use, which means that it can stay fully charged at all times if you are smart with how you use it. It really works and it really works extremely well. It is important that you keep it charged at all times because you never know when an emergency is going to happen. 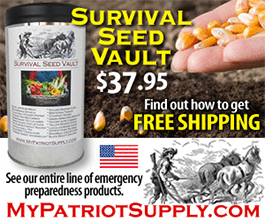 It comes with a great price too and it should be a part of anyone’s emergency kit. The sound that comes from this system is very clear and the tuner is digital, making it so you can get practically perfect reception for the stations that you want to get in. The only thing that it doesn’t offer you is a waterproof shell. I would suggest that you read the user’s manual for this item. There is a lot that it can do and you will want to make sure that you have a full understanding of what all of the it’s features before you are in an emergency. It is also a good idea to test it out, play with it, and use it on occasion. The only way to know how to use something is to practice with it. Overall, I highly recommend this product. You can find it here on Amazon for the best price and currently offers free shipping.